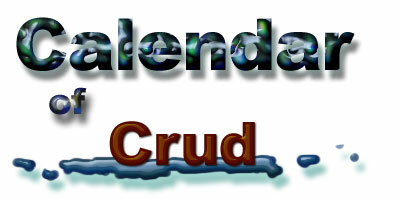 The Calendar of Crud piled up too many holiday horror dolls so "The Crock of Christmas" has to have its own unfortunate new page of Sonic-sullying bad plush dolls. It's time to say 'ho ho oh no' to tacky costumes, ugly construction, stupid ideas & cheap looking junk that should go on the naughty list. Let's start the grinching with Candy Cane Crud Sonic! Christmas colors just don't fit with Sonic's blue...so they made sure to pick the most rubbish green they could for the stripes on his withered hat & scarf. To further 'holiday-ize' him, theyve sewn a cheapo candy cane into his hand. The real problem here isn't the dorky decor though, it's the poorly plush construction. Sonic's face isn't cute or fun. His eye is all wrong & his spikes are dishevelled & floppy due to understuffing and a poor pattern. Also, where are his ears? If they're under his hat, they're too high on his already pretty tall head. I have some hideous striped fabric left over. Let's give it to Knuckles! Oh and we can make him more 'wintery' if we glue a piece of shabby felt to his feet and then claim he's "Snowboarding"! Sounds brilliant, those nerds will buy anything we churn out! What is going on with the hat? Does it somehow have 3 pompoms? Is his cheap scarf strangling him? Who stands on a snowboard the size of a wilted dinner plate? Also the face construction here is terrible & the 'smile' looks like a tacked on iron on. Sad. 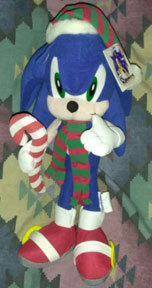 This is neither Holly nor Jolly, it is Sonic dressed (badly) as a stupid looking Christmas elf! Now his body is all green, and he has a festive vest and nasty striped hat. They've changed his shoes to elf-shoes as well, as you can see in the bottom of the picture. So basically what this is, is some elf body with a Sonic head sewn on top. The crock of Christmas continues with these lame dolls! How do you make something "Xmas" without any real effort? Why, just add in a lame flat candy cane probably found in a bin! Here, the only holiday aspect of Sonic and Tails is that they've had a candy cane sewn to their hand. But, is low effort better than really tacky sad costumes? It's 6 of one and half dozen of the other because, as usual, the patterns here are just no good. The belly dot is super pointy for Sonic & Tails' face isn't cute at all. Their eyes are also uneven. 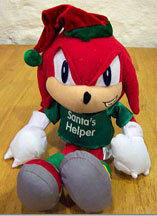 Knuckles is next as "Santa's Failure" er, "Santa's Helper". Now, they try adding a lame green shirt & hat to a rather irritated looking Knuckles doll to try and get people to buy this horrible 'holiday plush'. Where were these even sold? Were they some kind of prize? There's just SO MANY 'Christmas' variations of all the characters which are all just as badly done as the next with tacky gimmicks that it's tough to explain. Given the rest of the 'year of yuck' you know that there's a Christmas Shadow out there somehwere...waiting to be made fun of on here.